Living in modern times has turned us into watchers, placing a sliver of distance between us and everything we meet. It is this watching that disheartens our days, that takes the color out of the earth and makes the songs of time sound flat. The Native American view on this is healing. With respect for all aspects of Creation, we are asked to honor whatever we see – rock, rain fence or stranger – as a member of our family. . . . . in knowing the world this way, there is no such thing as metaphor. The wind is not God’s voice. The wind is God’s voice. Memories are not images of loved ones returning to us. They are the spirits of loved ones visiting us. He says it more eloquently than we. But the fact is, one of the reasons we do Italy is because the experience is one that makes us participants in life, not watchers. It is a gift everyone brings home with them from Orvieto and that they carry into their future. Pretty wonderful! 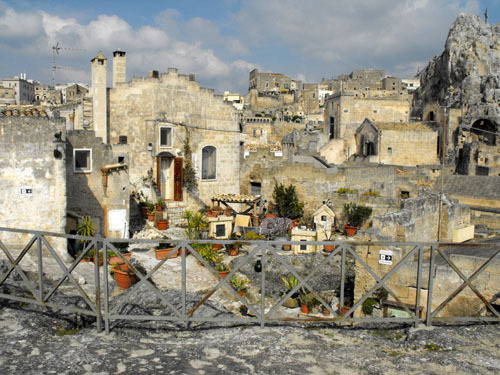 So how do we leave Matera? Can I convey the impact this place had on me, at least? It is very difficult. I think if you went quickly through this city, you would be amazed. But it is in the occupying of the place for a period of time that it works its way into you. Walking around with all the stone from which there is no relief, walking a normal alley only to have stone rise up out of it to heights of 15 feet or more above you, knowing there is some kind of habitation in that stone, you feel like, indeed you are, crawling in and out of the stone as if you were hiking the Grand Canyon. Yet intertwined amongst all this stone is a human habitation, some of it crude, some refined. You sense, you feel the harshness of life for so many centuries in this place. The ever present stone hardness, without relief, makes you hard. You steel yourself to what life imposes, clamp your jaw and soldier on. And yet, there is something about the indefatigable human spirit that emerges from it all, filling you with awe and inspiration. In spite of all the hardness, There is an admirable, human quality that brings a softness to the spirit. Too, there is an incredible ingenuity evident in how life was pulled from this stone. 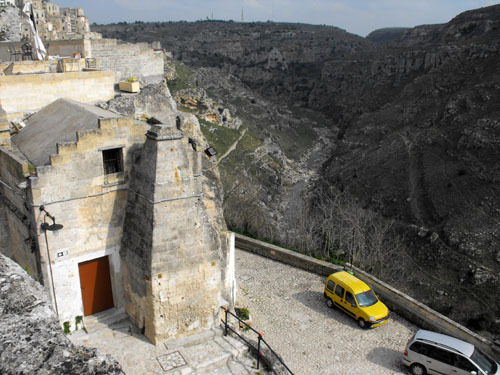 We talk with Vincenzo, our B&B owner, and the love and passion for Matera oozes from him. He’s proud to have a daughter he will raise here. He is eloquent in describing the life and character and wonder of the place. It is an inspired story. I can’t say more for I can’t quite capture it. All I can suggest is that you visit, and for more than just a day. And that in your visit you just wander, slowly. 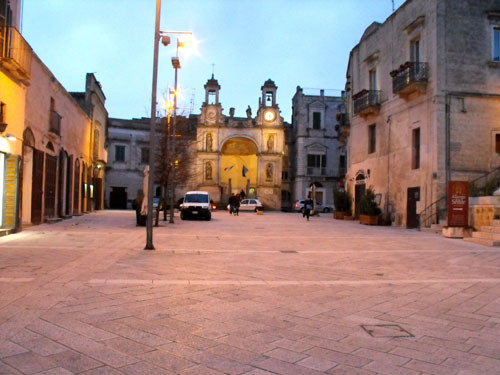 Feel Matera. Let it work on you. Take your time. Enjoy it! A last few pictures. 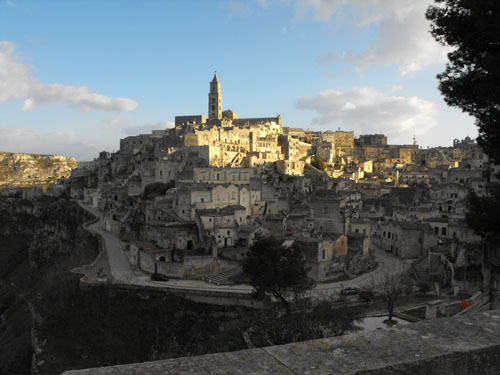 The sassi are what give Matera its one-in-the-world character. They are clearly the heart of this city, the soul-touching, psyche-jarring aspect that affected me so deeply. 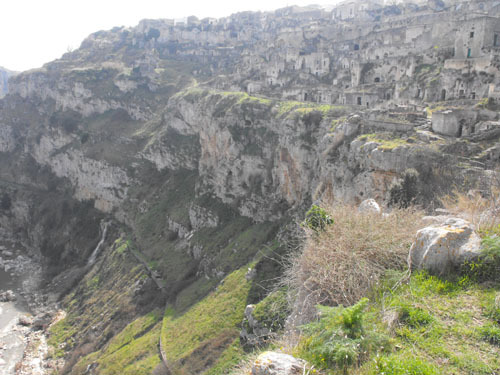 But it does have a city that emerged on top of the caves, one that, for a time turned its back to the sassi. 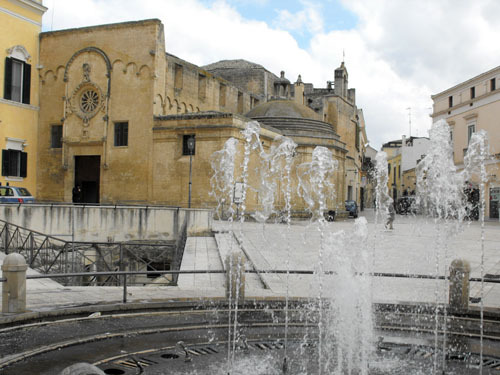 It is a pleasant city with some fine 14th century churches and some beautiful public spaces. 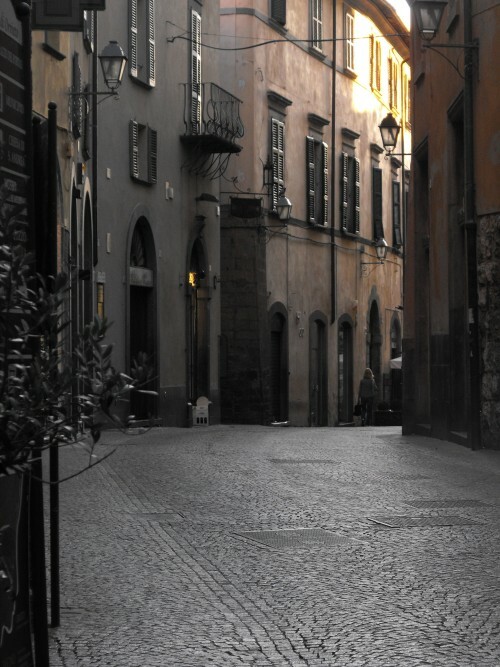 Their main piazza – Vittorio Veneto – is a lively place, full of people during the passeggiata and other times of the day. Piazza Pascoli Ridola is a very comfortable space. 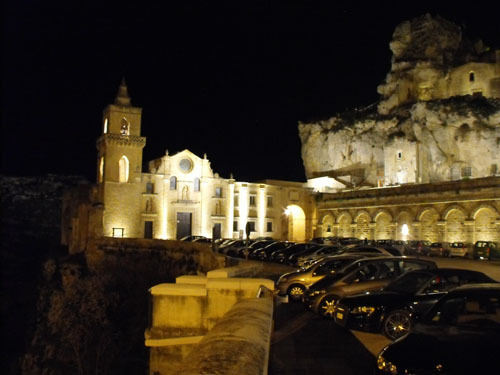 It was cold when we were there, but this is the piazza that would have had us sitting outside. Another nice piazza Sedile with the Palazzo Sedile at one end and the church of San Francesco d’Assisi on one side. Then there are the churches. 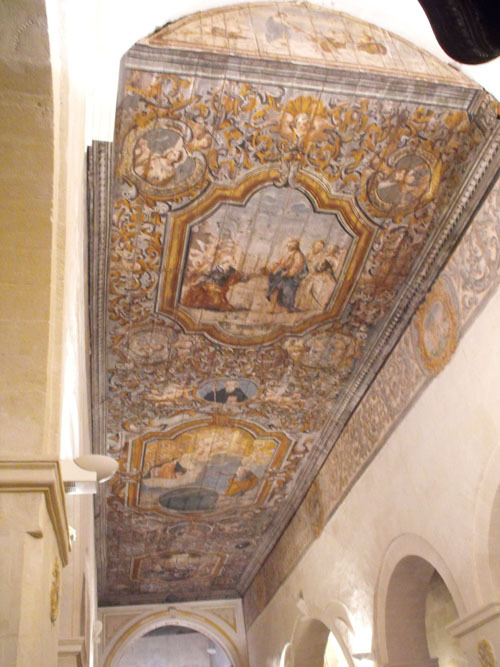 The church of San Pietro Caveoso has a beautiful painted ceiling. 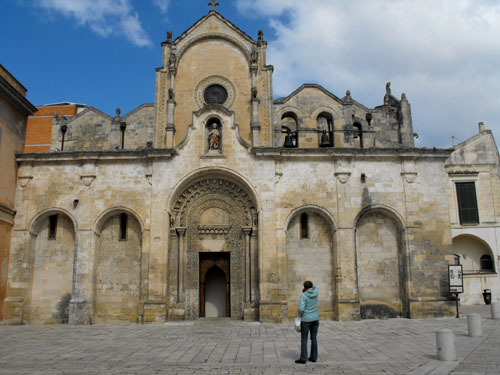 The duomo has been closed for years for restoration. In fact Carla, Vincenzo’s wife, has never seen inside despite her living here for 7 years. Still, it dominates the city. 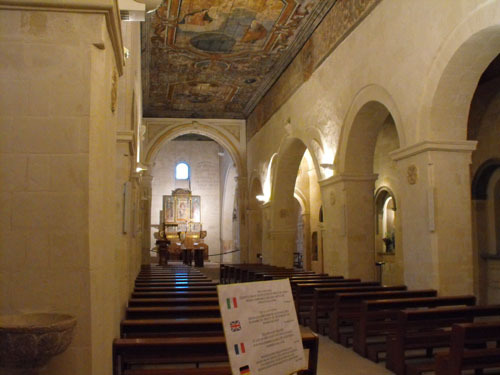 Our favorite church was San Giovanni Battista built around 1280. On one side it has some “dog tooth” detail reminding us a bit of a Norman church in Oxford, England. 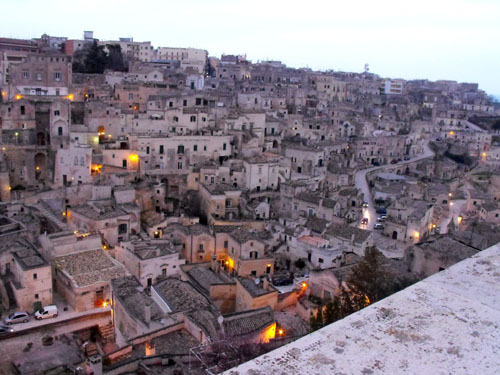 Matera is a beautiful city above the sassi. 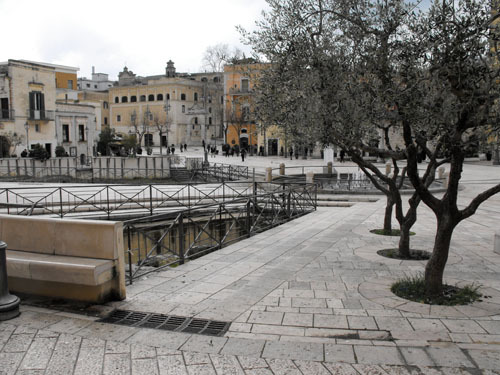 The sassi sitting below it add such an intrigue and diverse dimension to the city. One last shot of San Pietro Caveoso sitting on the edge. 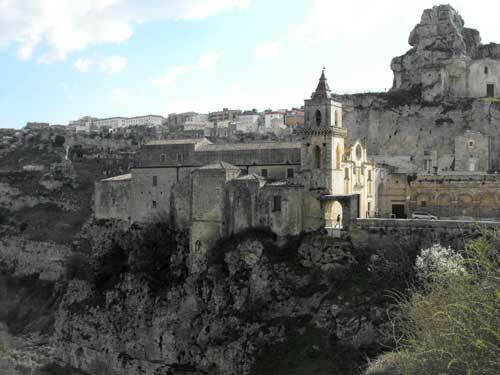 The stone jutting up above it houses two churches inside the stone caves, complete with frescoes. Where else in the world can you experience such contrasts? 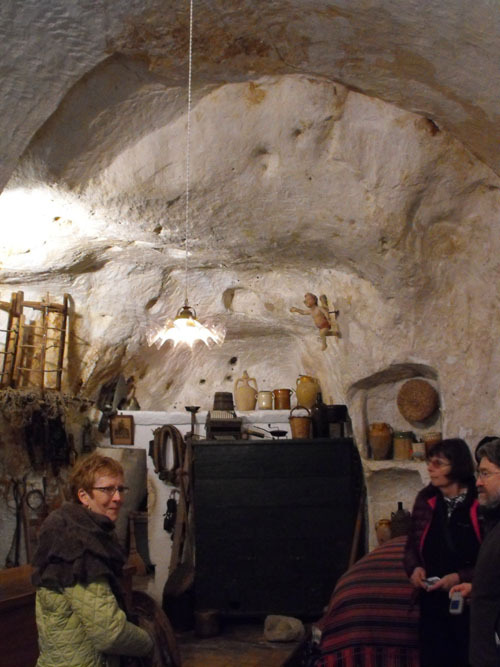 Casa Grotta di vico Solitario provides a glimpse of what it was like to inhabit one of the caves. This is unquestionably a sanitized version. 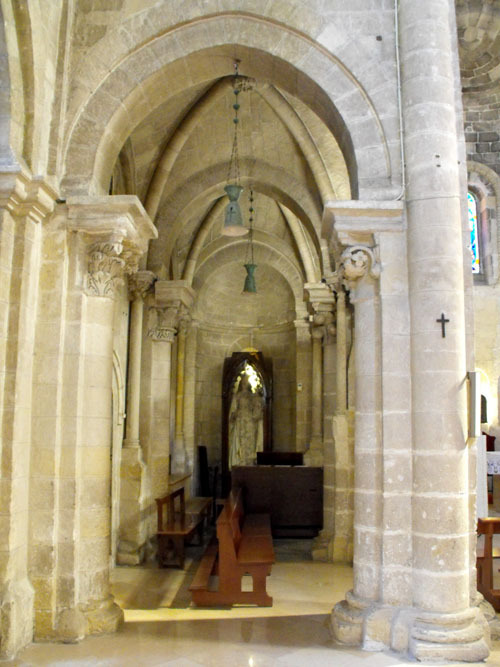 As you look at the images imagine what the smells must have been like and how dark it would have been with only one door and perhaps one or two small openings to provide natural light. 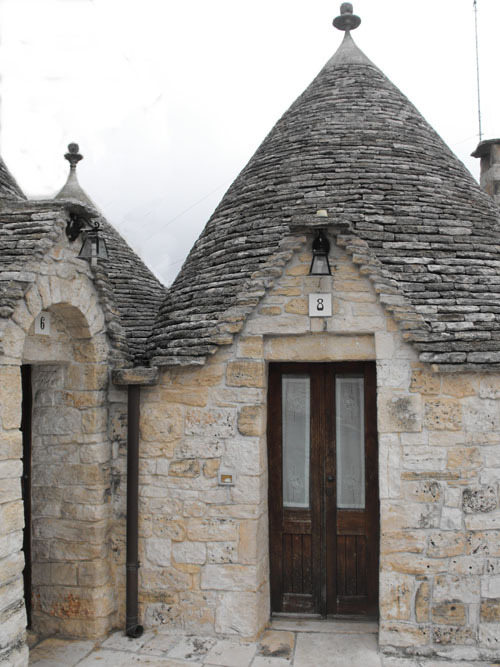 Like the trullo house in Alberobello, this sasso had one main room in the center. This gives a sense of the height of the cave. Bed on the right and alcove beyond the dresser at back. 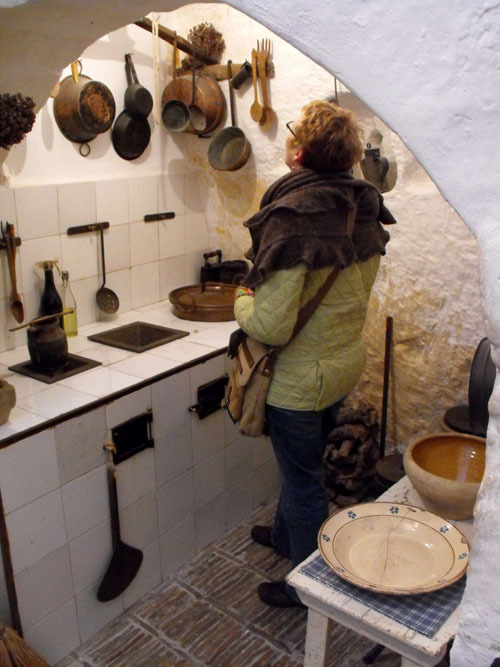 The kitchen had a small window at top. 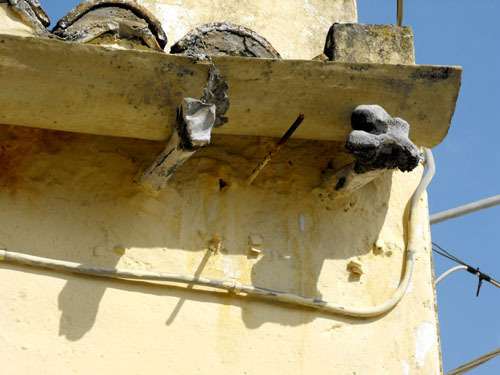 Stove was vented outside. 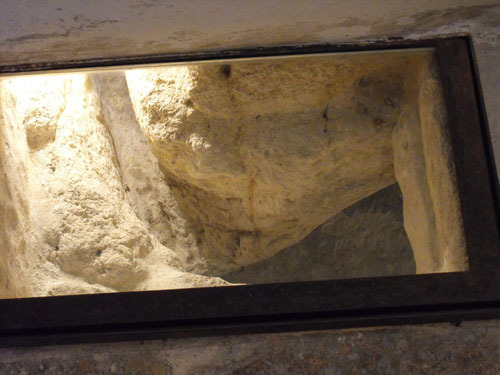 Exposed channel that would carry water to the cistern. 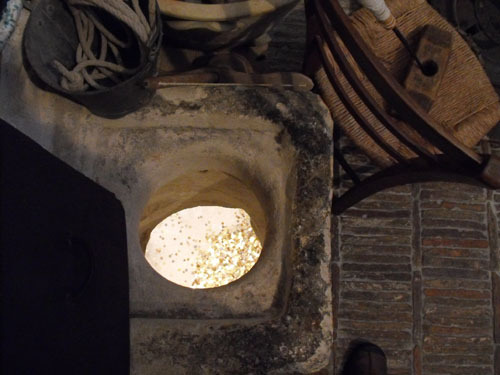 The hole into the cistern, which is lit up from below. drop a bucket to get water. There was one large bed in the main room, raised off the ground and the cold. The tops of large storage trunks served as sleeping surfaces for the children. The loom, just to the right of the cistern opening. There was a small table in the large room. This is where the dinner would be placed. Inhabitants would serve themselves, standing to eat. 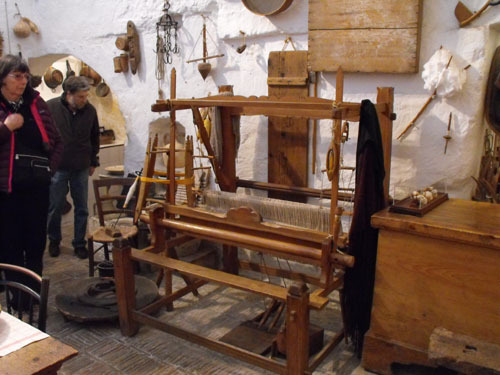 A large loom took up considerable space. 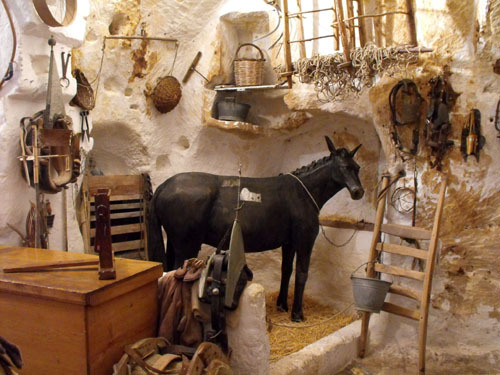 And, as with the trullo, the expensive and prized mule was kept inside the sasso. Now, can we imagine this space lit by the door and 2 small windows and a few candles? Would it have been whitewashed? I don’t know. I thought the floor was beautiful. This was the condition into the 1950s. 15000 people occupied what realistically could support half that number. 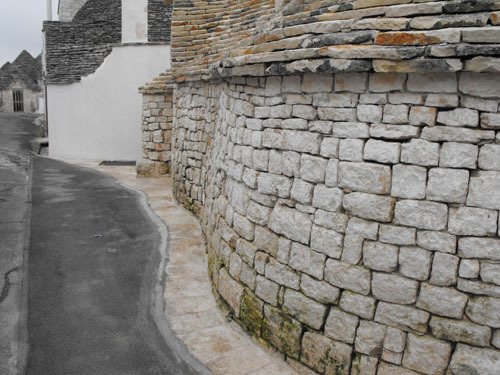 Today the sassi are being transformed into beautiful spaces. But it is good to have a reminder of what it once was like. You just never know! 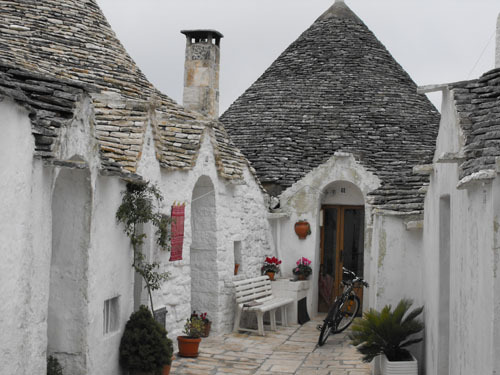 We were lucky enough to have made reservations at alla Dolce Vita B&B. 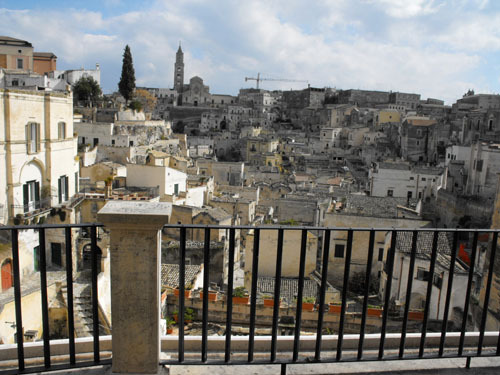 Matera has dozens of choices for places to stay. But we, fortunately, ended up here where Vincenzo, a native son of many generations, and his French wife Carla have set up shop. They are a treasure. The depressions were the graves. Beneath the graves in cave is the church. Romans to the Church to the mafia. The general populace received protection and jobs from the powers that be – for a price. 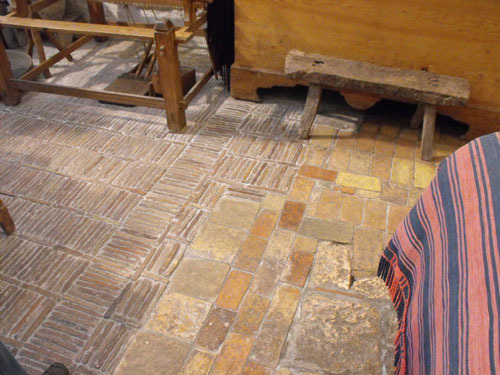 He showed us a church tile on a building – evidence that the church was given the dwelling by its owner in return for a guaranteed place in heaven. The surviving family still occupied the building, but now paid rent. It was business! 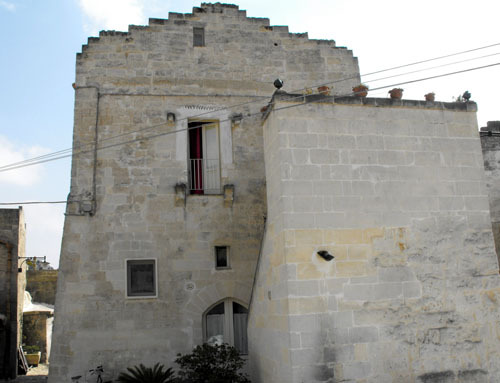 When the government began relocating the sassi dwellers to new apartments, the two sassi emptied and deteriorated. 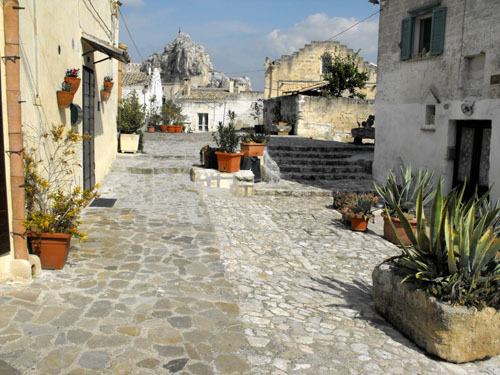 With UNESCO designation has come tourism and the opportunity to reclaim and appreciate the sassi. So now government is encouraging people to repopulate the sassi, offering incentives. It was a long and arduous process – 10 years – to get their B&B up and running. But what a warm, cozy, comfortable place. We had an apartment, complete with kitchen. The circle to the right is access to the cistern below. 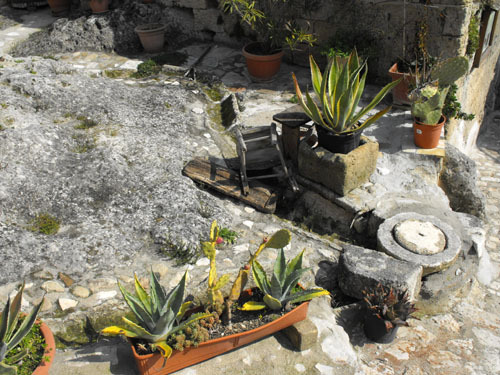 You can see channels leading to the circle to direct surface water into the cistern. stone surfaces in cisterns below the surface. They are all interconnected. If yours fills it flows into your neighbor below and so forth. Ultimately there are several huge communal cisterns for the last overflow. Should it fill, it flowed out into the street to wash away sewage. The caves were used in summer to collect water from moist air condensing on the cave walls. Communal space for several dwellings. They shared a wood oven in this space. Wood being scarce, they heated the oven and shared the oven for cooking. 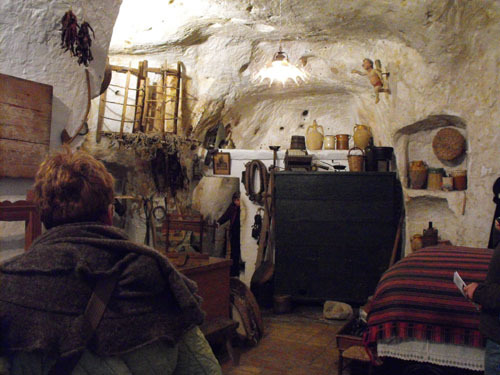 We’ll take a look at a cave dwelling next. 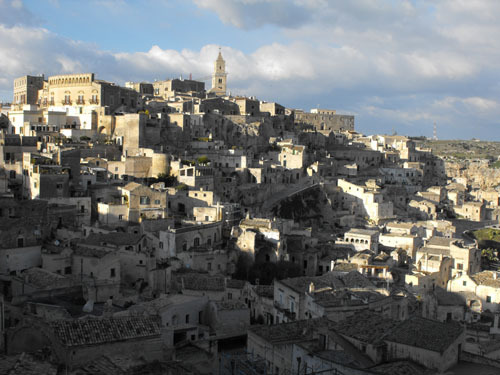 In ancient times one would approach Matera with no idea a city existed. Today buildings arise from the ground. 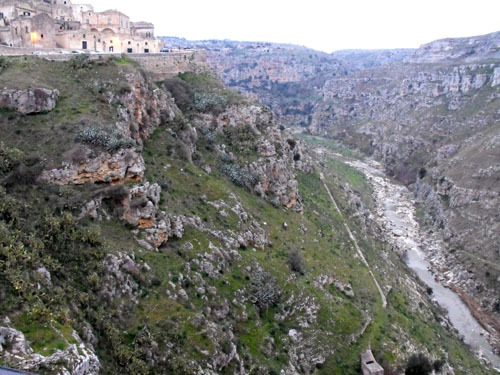 But it is not hard to imagine, as one rides the train over the somewhat barren rolling plain leading to Matera, what it was like in ancient times – no hint of a city below your feet. 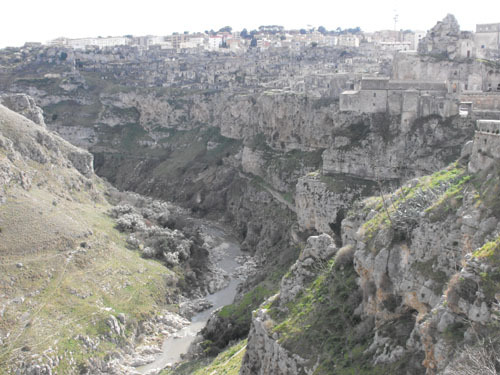 Matera, the river they call a Torrent. 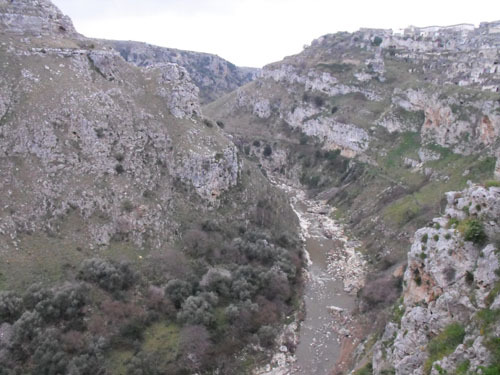 The first settlers chose this side of the gorge because it had the more favorable orientation. Caves riddle the upper part of the gorge, one on top of the other. 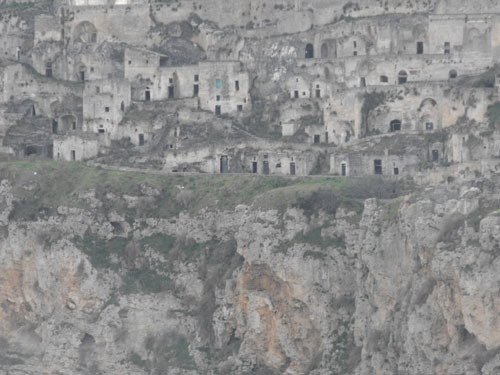 And it was in these caves that people made their homes, invisible from the plain above. Like most places, it has had its ups and downs. 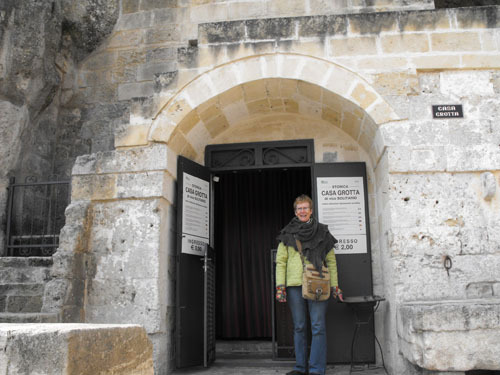 It was an important outpost during the Roman times. 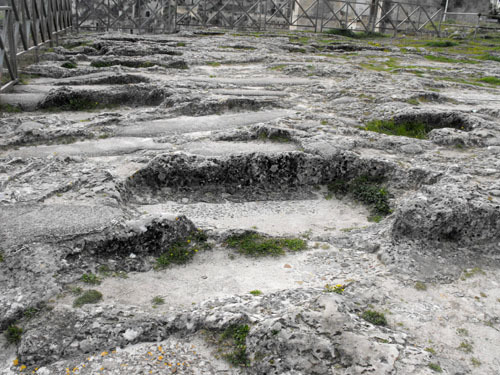 Roads from the port cities of Taranto and Brindisi met here. 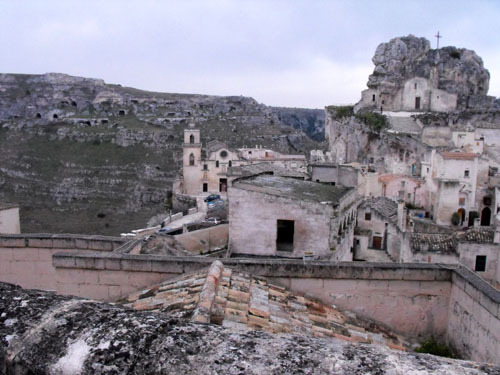 From Matera the Apian Way took off for Rome. 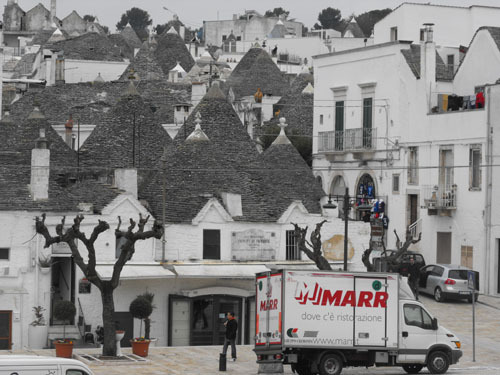 The cool sassi made the perfect storage place for perishable goods in trade. But by the 1950’s the town was a backwater with no running water, sewer or electricity. 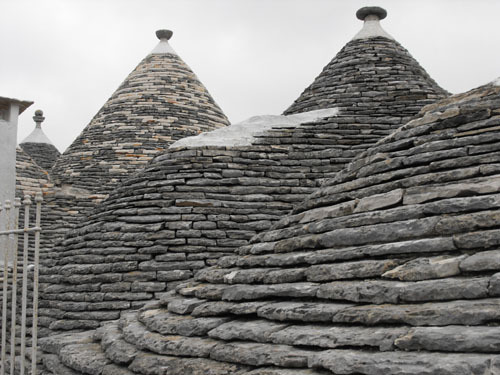 The sassi were overcrowded with an infant mortality rate of 50%. The government forcibly removed 15000 residents to new housing on top of the city. 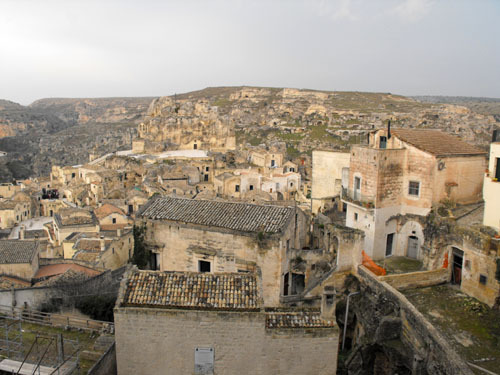 It was the 1993 designation of the sassi as a Unesco World Heritage Site that started the climb back for Matera. It is, for me, at least, nearly impossible to describe the feel of this place. 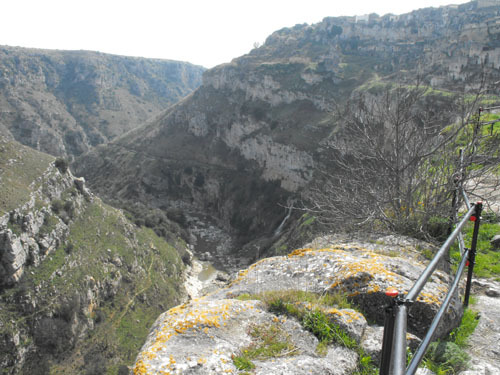 The sassi tumble down the gorge face. 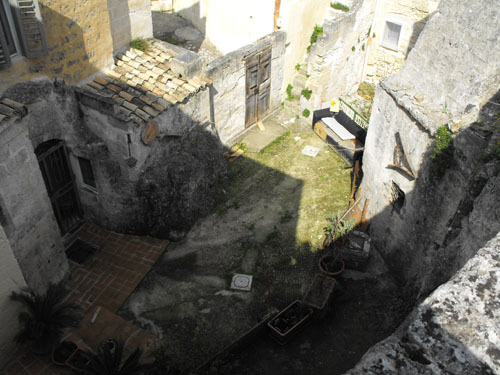 The stone ‘back yard’ of one house is the roof of the one below. The graveyard with graves dug from the stone forms the roof of the church below, housed completely in a cave with frescoed walls. 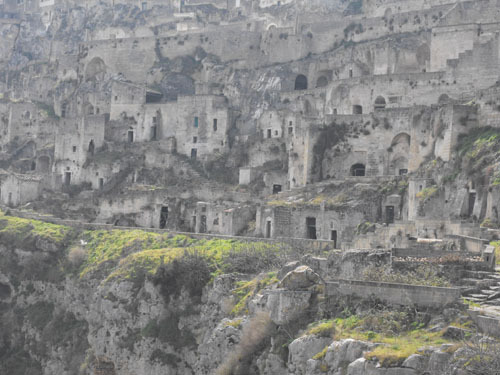 You can vaguely imagine the grim life that existed in the sassi. Stone is everywhere with little relief. Pictures help tell the story, but they too are inadequate. This is a place that you must simply come to and become immersed in to let its character, mystique, charm and eeriness settle on your bones and pysche. 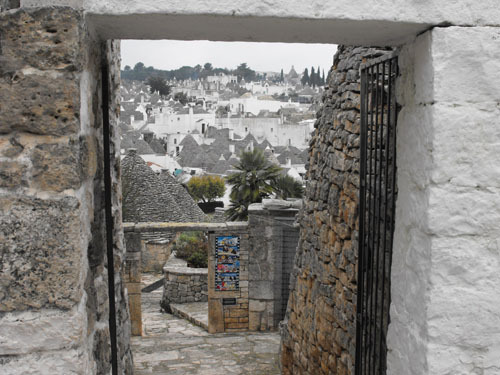 I will capture as best I can Matera over the next few entries, but honestly, you really need to go there! 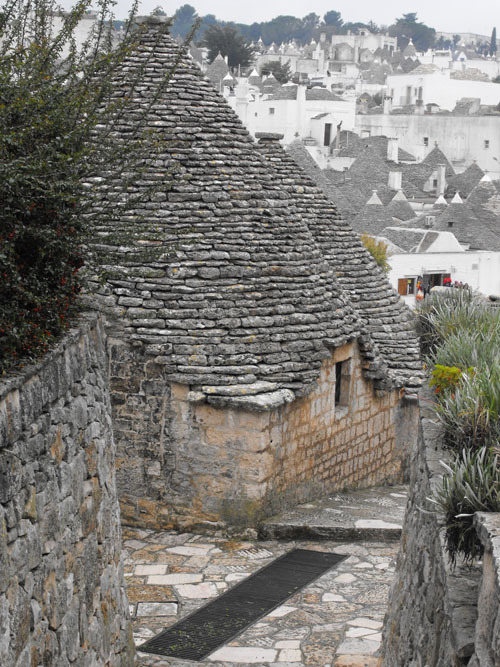 Alberobello, which means beautiful forest, is an incredibly impossible town. 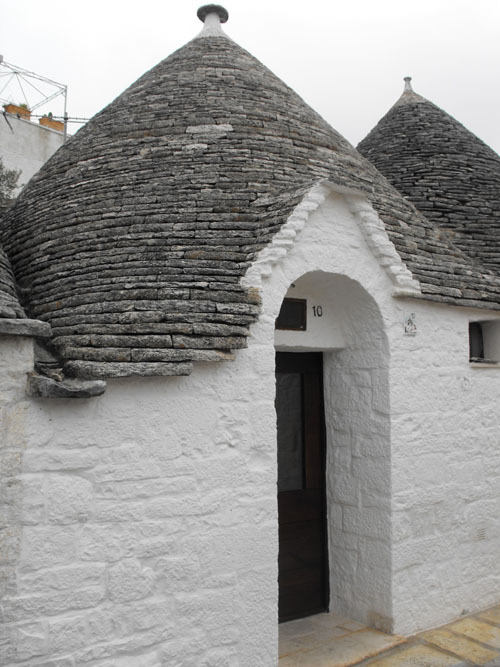 On two hills sit approximately 1500 trulli. One hill has about 1000 of them, the other 500. The hills are a Unesco World Heritage site because of the houses. The hill with 1000 houses is full of tourist oriented shops. The other is more of a neighborhood. The city used to be an oak forest, thus the name. 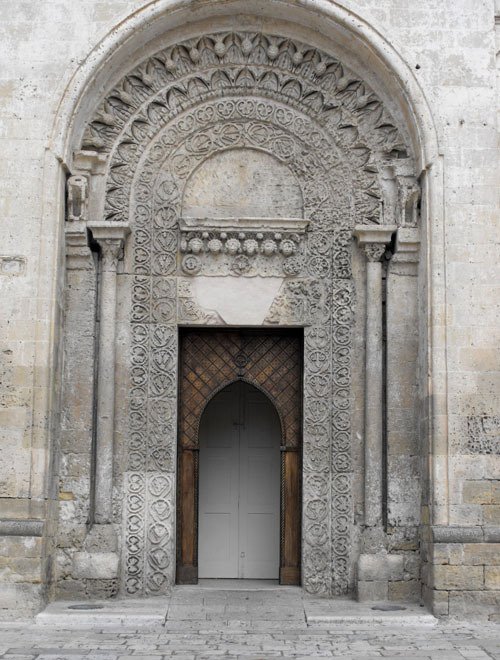 It was given by Ferdinand I of Aragon to the Aquaviva family in 1480 for the family’s help in repelling the Turks. 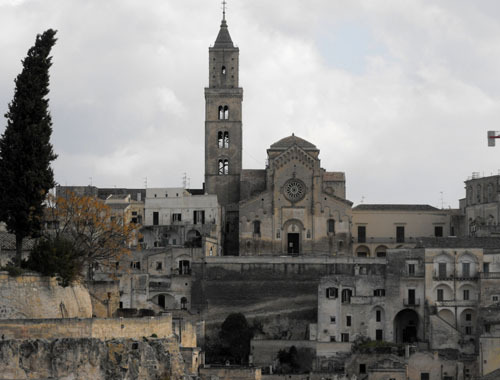 The town began to form when Giangirolamo d’Auaviva ordered people from neighboring towns to settle and cultivate the land. 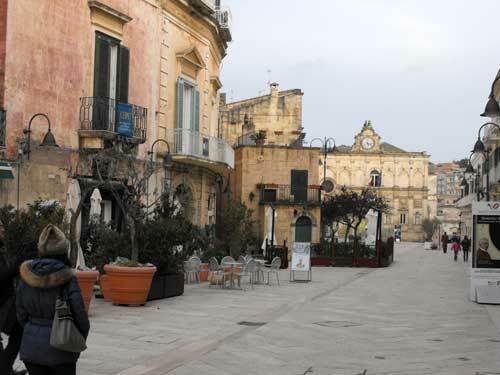 The Unesco designation led to the revival of what had been a depressed city. While the tourist shops detract a bit from the one hill, the lanes are undeniable picturesque. 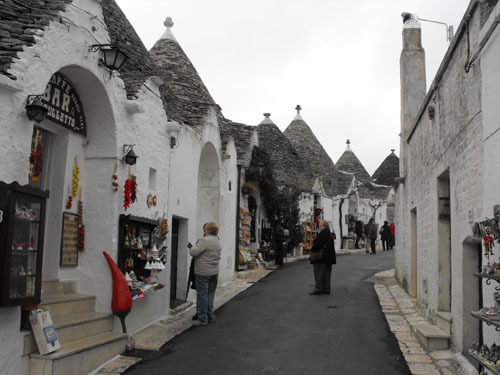 And the less touristy side, while housing fewer trulli, is simply charming. Here are pictures.